One of the inevitable consequences of the Paris terrorist attacks is that France will need to spend more on security, especially on intelligence. So will most member states of the Schengen area. Schengen is the name for the passport-free travel zone made up of 26 European countries, including 22 EU states. Last week it became clear the security network that supposedly operates quietly and efficiently in the background of Schengen is not working. The death of Abdelhamid Abaaoud during a police raid on the Paris suburb of Saint-Denis was at one level a big success. The police got the suspected terrorist who co-ordinated this and other attacks. On another level his death was also a nasty shock. What does it say about Schengen if one of the world’s most wanted criminals was able to move freely between Syria, France and Belgium? That was not supposed to be possible. There are, in principle, two fixes. Repair Schengen; or revert to national systems. Both work. The first would be economically efficient but is politically hard to do. The second is politically easier to do, but would constitute a spending shock of macroeconomic scale for many countries. The repair of Schengen would have to go beyond the unambitious agenda of justice and interior ministers, who met last Friday to consider a few practical proposals. The problem with Schengen is that within a few weeks it has lost its biggest asset — the trust of the population. President François Hollande clearly did not trust the system. Why else has he reimposed border controls? For Schengen to regain trust, the control of the common external border would have to be of the standard of the very best of the member states, not at some fudged EU average level. The EU runs an agency, Frontex, based in Warsaw, tasked with co-ordinating policy and maintaining standards. But crucially, in the Schengen area every country is responsible for maintaining its own external border controls. The external border of Greece, for example, is also part of the Schengen area’s common external borders as well. Frontex does not have the resources even to do its limited job properly, let alone to act as a federal-level border control unit, which is what is really needed. America has the US Citizenship and Immigration Services, which are part of the Department of Homeland Security, and the US Coast Guard, which is a branch of the armed forces. In Europe, we rely on civil servants passing information to each other. Or not — as it turned out. The EU will tinker with Schengen, but not fix it. Sound familiar? When the eurozone crisis started, a few bold measures would have fixed it. But there was no political majority for a federal-level solution to the banking and sovereign debt crises. Why would EU leaders do the right thing for Schengen, when they failed to do it for the eurozone? The alternative would be to allow Schengen to wither away, to revert to national systems, and implement the necessary changes at home. This is what I expect will happen. It is not a bad option. It will work because member states have their base infrastructure still in place. It is, of course, terribly inefficient for 26 countries to operate their own intelligence networks, and to police their internal borders. The length of the borders around France and Germany alone is about 3,000km each. The external land border of the whole Schengen area is only 8,800km. If Humpty-Dumpty falls apart, there will be lot of bits and pieces, and lots of protruding edges. The internal borders would return. Before the attacks, they were almost invisible. On the train from Brussels to Paris, you would be hard pressed to notice when you changed countries. On the motorway, a derelict frontier post would have reminded you that there was once a border, followed by a country sign encircled by the twelve EU stars. Schengen turned the Molenbeek district of Brussels and Saint Denis in northern Paris into adjacent neighbourhoods. The terrorists led the life of commuters, living in Brussels and working in Paris. Since we are not going to fix Schengen, let us return to national border controls. It will be very expensive, especially for France, which has yet to build up a fully functional domestic security service. It will be of an order of magnitude to derail any budget plan and will rouse the ire of eurozone bean counters. France should invoke, unilaterally if need be, the clause of an exceptional circumstance under European budget rules. The overriding goal has to be to preserve one of the most important common goods the EU can provide to its citizens: a modern and professional level of internal security. Schengen cannot deliver this. But the member states still can, and should be allowed to do this. Barclays has advised clients to jump into world stock markets with both feet, citing the fastest growth in the global money supply in over thirty years and an accelerating recovery in China. Ian Scott, the bank’s global equity strategist, said the sheer force of liquidity will overwhelm the first interest rate rises by the US Federal Reserve, expected to kick off next month. Global equities rose by an average 15pc over the six months after the last three US tightening cycles began, on average, and Barclays argues that this time stocks are cheaper. The cyclically-adjusted price to earnings ratio (CAPE) for the world’s equity markets is currently 18, compared to 25.5 at the beginning of the last rate rise episode in 2004. This is roughly 14pc below the CAPE average since 1980, though critics say earnings have been artificially inflated by companies borrowing a rock-bottom rates to buy back their own stock. Mr Scott said the growth of global M1 money – essentially cash and checking accounts – has surged to 11pc in real terms, led by China and the eurozone. This is higher than during the dotcom boom and the pre-Lehman BRICS boom. It is likely to ignite a powerful rally in equities nine months later if past patterns are repeated, although the lags can be erratic, and the M1 data gave false signals in the mid 1990s. Barclays said American stocks are trading at a 30pc premium to the rest of the world. This gap is likely to close as emerging markets - "the epicentre of negative sentiment" - come back from the dead. The pattern of foreign fund flows into the reviled sector has triggered a contrarian buy-signal. Everything hinges on China where real M1 money has ignited after languishing for over a year. Floor space sold is growing at 20pc and house prices have stabilized. Chinese fiscal spending has jumped by 36pc from a year ago and bond issuance by local governments has taken off, drawing a line under the recession earlier this year. "A growth revival is under way and will gather strength into the first half of 2016," he said. Barclays is not alone in calling the bottom in emerging markets. Amundi Asset Management is cautiously buying, based on a 'soft-landing' hypothesis for China. Kamakshya Trivedi from Goldman Sachs is also nibbling, though the bank remains bearish on China and has ditched its infamous `BRICS' fund to focus on a more coherent concept. Mr Trivedi said there is no going back to the "roaring 2000s" but the worst may be over after three years of dire returns. “2016 could be the year emerging market assets start to find their feet," he said. Capital Economics has been caustic about the BRICS for several years but said the hard data at last point to a tentative rebound for the emerging market nexus as a whole. "All told, there doesn’t seem to have been much justification for the alarmist talk that gripped the markets in the summer," said William Jackson, the group's senior emerging market economist. Sceptics abound. Nobody knows for sure what will happen to the most indebted countries if the Fed embarks on a serious tightening cycle. Dollar debts in emerging markets have jumped to $3 trillion, and much higher under some estimates. Private credit in all currencies has risen from $4 trillion to $18 trillion in a decade in these countries. Research by the Bank for International Settlements suggests that rate rises by the Fed ineluctably lifts borrowing costs everywhere. Barclays said the US rate rise cycle is a tonic for global financial companies. It has raised its weighting for banks, insurance companies, and other finance stocks to 31.9pc. “We think global banks are severely under-priced,” said Mr Scott. He likes AXA, Banco Popular, Citigroup, JP Morgan, Lloyds Banking, ICBC, MetLife, Intesa San Paulo, among others. Bonds are likely to suffer if global recovery builds and fears of 'secular stagnation' give way to an incipient reflationary cycle. The bank said the worst sectors at this phase of the cycle are real estate and utilities. Materials and commodities may instead make a come back. These are what it calls the "anti-bond" equities. They are trading at a near record 34pc discount to "bond-proxy" sectors. Materials and commodities may make a come back. Barclays is heavily overweight energy - at 11.9pc against the benchmark 6.8pc - backing Shell, Marathon, Total, Conoco, Suncor, and Valero Energy, as well as the fertilizer group Agrium. Mr Scott said "value stocks" - underpriced relative to fundamentals - are about to come into their own again. These are trading at the cheapest level relative to "growth stocks" since the dotcom bubble, based on the CAPE measure. Barclays is betting that the 12pc rout on global stock markets this summer was a false alarm - or a pause to catch breath - along the lines of the Asian financial crisis in 1998. The blast of stimulus that followed in 1998 drove a two-year boom in global equities before the cycle ended. The bank may be wrong but there are no signs of the complacency and wild 'animal spirits' that typically mark a speculative top. The bull/bear ratio tracked by Investor's Intelligence is far below previous late-cycle peaks. As long as markets are climbing the proverbial wall of worry, investors can take comfort. Pessimism is a fund-manager's best friend. Analysts falsely believed Islamic State was too weak to carry out terror attacks abroad. But IS views terror as a means to an end -- and will launch attacks as long as they continue to serve its broader strategy. "It was a terrible night. We heard the roar of the jets, the detonations. Then, the power suddenly went out and everything sunk into darkness," the young woman on the phone says. She said that she could only see the flashes from the explosions, with one bomb landing right near where she was. "But I don't want to die after all that we have already gone through here." The woman is from Raqqa, where Islamic State has its headquarters in Syria. She lives there together with her parents and brothers. Still. As do so many other civilians. On the phone, she was describing the first wave of attacks in the "war" that French President François Hollande declared against Islamic State following the attacks in Paris. The bombs dropped by French fighter jets hit both used and abandoned IS bases, the former army camp of Bashar Assad's Division 17, the polyclinic, the horse racetrack and a main power cable. The woman's brother is a taxi driver, and he witnessed numerous injured fighters being brought to the hospital, which had been closed to civilians. Still, the raid isn't likely to have hit any Islamic State leaders. The air strikes over the weekend were apparently an attempt to kill Abdelhamid Abaaoud, who is thought to have been a key figure behind the Paris attacks and who the French initially thought might be in Raqqa. He was ultimately killed in Wednesday morning police raids in the Paris suburb of Saint Denis. But the upper echelons of IS have been living for months in the city's densely populated residential areas and are careful to keep their movements inconspicuous. As such, they have likely been able to escape the US-led coalition's airstrikes, which have been ongoing for 15 months. The attacks in Paris, Beirut and Ankara, and the bombing of the Russian Metrojet flight over the Sinai Peninsula, have shown the people around the world just how vulnerable they are. That is not quite as true, however, for the authors of those attacks: At the most, airstrikes have weakened Islamic State, but have certainly not defeated it. Hollande has declared a war that is almost impossible to wage. The French jets had hardly landed before US President Barack Obama issued a rejection of any more involved forms of warfare. Sending ground troops into Syria or Iraq, he said, would be a mistake. US Security Advisor Ben Rhodes told SPIEGEL: "It's not simply a reluctance to commit ground forces. It's a belief that that's not a sustainable approach." In the aftermath of Paris, the question as to how we can best oppose Islamic State has become more urgent than ever. But to answer that question, we need a clear idea as to what strategy the jihadists might be following. The idea that the attacks were the desperate actions of a collapsing group of apocalyptic extremists isn't consistent with the military situation on the ground, nor with the organization itself. It's also implausible that the attacks took place now because the opportunity only just now presented itself. Because whatever Islamic State has done in recent years, whether taking control of cities or conquering entire regions, it has only launched offensives after thorough preparation and at moments when success seemed most likely. An organization that was able to deploy 23 armored trucks full of explosives, heavy artillery and mustard gas merely for a September attack on two small Syrian cities certainly has the military and financial means, as well as the expertise, to launch attacks elsewhere as well. Previous assassinations of rebel commanders and journalists outside of Syria and Iraq have revealed a pattern: IS smuggles sleepers in over an extended period, or recruits them locally. It then only activates them months later -- and the murderers are often close confidants of their victims. Since 2013 at the latest, Islamic State has been able to infiltrate enemy forces, such as Kurdish militias which logically suggests that IS may have established several cells in Europe that are simply waiting for the signal to strike. Only now, it would seem, does the terror group seem to believe that attacks in the West, which it has long been threatening, carry more benefits than costs. Europe has become more fragile recently, not least because of the acceptance of more than a million refugees, and has become more open to prejudice, panic and political polarization. This is exactly the vulnerability that the terrorists apparently aim to exploit. The fact that an intact (though probably fake) Syrian passport was found near the bodies of one of the suicide bombers is likely no coincidence. Suddenly, all Syrian refugees are viewed as potential terrorists -- just as IS had hoped. The Paris attacks were logistically complicated operations with at least eight terrorists striking at several locations in the city. They likely prepared the attack over an extended period of time, avoiding attention all the while. But it was also a relatively simple attack from a technical standpoint. The terrorists targeted unsecured restaurants and a concert hall -- and proved unable to breach the security at Stade de France. Prior to the latest attacks, the prevailing theory was that Islamic State wasn't perpetrating terror attacks abroad because it was unable to do so. That was a mistake stemming from a misunderstanding by terror experts, politicians and journalists that Islamic State would ascribe to al-Qaida's ill-conceived notion that terror by itself would lead to the collapse of Arab regimes from Saudi Arabia to Egypt as well as to the dissolution of the United States. But al-Qaida's prediction was very wrong. Both the attack on tourists in Luxor in Egypt as well as the Sept. 11, 2001 attacks in the US engendered swift and severe responses. In Egypt, the response resulted in the collapse of violence-prone Islamist groups while al-Qaida was driven out of Afghanistan following 9/11. Al-Qaida believed that the masses would rise up to support them, which never happened. The idea of resurrecting the global Islamic empire may have existed as a vague utopia, but the group wasn't sure how to get there. Al-Qaida never had a military strategy for the conquering of territory, no plans for taking entire cities and no ideas for establishing control over reliable sources of revenue. Islamic State, by contrast, aimed to establish a state from the very beginning. That goal is part of the group's DNA. The fact that it long avoided carrying out massive attacks in the West was wrongly interpreted as weakness. But IS had merely reversed the priorities long held by jihadists. Attacking central state power with terror had consistently failed, first in Egypt and most recently in Iraq. That is where IS was born roughly a decade ago, originally as a collection of Iraqi and international radicals before being joined by officers from the Iraqi military and secret services, both of which were disbanded in 2003. These men, whose formative years were spent preserving Saddam's power, took over leadership of Islamic State in 2010 and transformed the group into the calculating and successful military monster we know today. Since then, the terror group repeatedly demonstrated its ability to change and adapt. When its first attempt at military expansion failed in Iraq in 2008, it transformed itself into an elusive and fearsome mafia organization in the northern Iraqi trade metropolis of Mosul, living off of protection money. All companies, supermarkets and restaurants -- even pharmacies and real-estate agents -- were systematically extorted, with murderous thugs dispatched to collect the money. According to US estimates, Islamic State was able to take in some $12 million each month in Mosul alone. When state authority collapsed in Syria in 2012 as a result of the civil war, the moment had come for Islamic State to expand -- clandestinely at first, but then with brutal forthrightness. The plans developed by IS strategist Haji Bakr -- who was killed in early 2014 in northern Syria -- to conquer the civil war-torn country were essentially a combination of Saddam Hussein's proven methods of oppression with Lenin's strategy of orchestrating a power grab using a small but powerful group of fighters. But they haven't merely been adept at striking hard -- IS has proved perfectly able to conform to whatever situation presented itself. For many years, Haji Bakr had been a colonel in the Iraqi military's intelligence agency, was a brilliant logistician and a kind of project manager in the shadow world of horror. Expanding reach and power in the name of jihad was his new Project. The Group was outwardly doing God's will, but remained so internally flexible that its own ability to morph and transform became its battle cry: "Baqiya wa tatamaddad," or "remain and expand." The idea is to attack when possible, but hole up for the winter when necessary, only to emerge and attack again. In this strategy, terror attacks are merely one means among many. They serve to demonstrate the vulnerability of those attacked, to avenge Western air strikes, to help recruit additional supporters and to underline Islamic State's claims to omnipotence. Still, such attacks are an ambivalent tactic for Islamic State -- because as a state, which it desires to be, IS itself is vulnerable. It presents a territory that can be attacked. In two collections of files left behind by IS when it fled the Aleppo province following fighting there in January 2014, there were no indications that attacks were being prepared in Europe or the US. There were no plans for the establishment of sleeper cells, no military training and no mention of what European Islamists should do once they returned home. There were likewise no details pertaining to money transfers. The files including documents from Islamic State headquarters in Aleppo and Haji Bakr's plans for developing IS. Both collections were analyzed exclusively by SPIEGEL. At the time, all of the group's energy and means were being focused on expanding in Syria and Iraq. The plans, though, only pertained to part of the larger strategy, and only extended until the end of 2013. But they did reflect Islamic State's priorities: expansion, control, dominance. If they want a state, they must first create it. This emphasis is on clear display in the decisions taken by IS over the last two years. All of which begs the question: What calculations have now led IS to perpetrate attacks in the West? For one, it plays into IS hands for Europeans to ratchet up their skepticism of Muslim refugees. For another, IS has positioned itself in the enormous battlefields surrounding its core territories in a way that it would make it difficult for others to launch a ground offensive against the jihadists. Such an offensive would also require a large number of troops. From Western comments, particularly those of the US, Islamic State strategists know that a ground offensive involving Western troops is extremely unlikely. Should an offensive be launched anyway, though, IS believes that the attack could, paradoxically, help the group on the long term. Ground troops could likely only be deployed with Russia's approval, and Moscow supports Assad. And if the West were to change course and suddenly intervene in Syria on Assad's side, all rebels in the country would immediately become enemies of the West. Were that to happen, Islamic State could pose as the last protectors of Sunnis in the region and expand its influence. The old saying, that the enemy of my enemy is my friend, no longer applies in Syria and Iraq. In both combat zones, US efforts have been hampered thus far. In northern Syria, America's Kurdish ally is unfortunately the enemy of another Washington ally, the Turks. In Iraq, Islamic State's Shiite enemy is also America's enemy. Shiite militias, under the military leadership of Iran's Revolutionary Guard, are heavily engaged in the battle against IS, but with their ferocity, they are also pushing more supporters into Islamic State arms. Taken together, the Sunni-Shiite conflict combined with the Turkish bombardment of Kurdish positions has reduced pressure on IS. To be sure, Islamic State has been forced to accept some losses in recent days: It lost the small northern Iraq city of Sinjar not long ago following a 15 month fight with Kurdish Peshmerga fighters. In two places, the Kurds have managed to block the most important road connecting the two IS "metropolises" of Raqqa and Mosul. US fighter bombers have likewise destroyed 116 tanker trucks used by Islamic State to transport its oil. In Iraq, IS has slowly been losing territory ever since it launched a lightning strike to take over the provincial capital of Ramadi, just west of Baghdad, in mid-May. In Syria, meanwhile, IS expansion has largely been halted since the end of the summer. Yet it is still a long way from exhibiting the convulsions of a collapsing empire. The constant muttering about the end times and apocalyptic battles may serve as good Islamic State PR -- with respect to both its followers and to the rest of the world. But if destruction was the only goal being pursued by IS, it wouldn't try to establish a state, it wouldn't be careful to avoid damaging grain silos when taking them over, and it wouldn't pursue scrupulous realpolitik, even with its own enemies. IS strategists look several moves into the future. To defeat the terror group, the West must do the same. It must bring together pro-regime Syrians with the rebels, a project that will not succeed so long as Assad remains in power and which is made all the more difficult by Russia's intervention. In Iraq, Sunni and Shiite factions divided by fear and hate must be brought together again -- though the West can only help, it is the Iraqis themselves that must achieve this. In short, the West -- together with Russia, Iran and the Arab Gulf states -- must create the conditions that could make a ground offensive against the jihadists possible in the first place. But as long as that doesn't happen, the world will allow a monster to continue growing. It is a monster that is today applying its battle-tested "Syria Model" of power expansion to Libya. And it is a monster that may even cease launching terror attacks were it left alone to continue expanding its foothold in the Middle East. Because terror, in the final analysis, is but the means to an end for Islamic State. When I was a boy, a carnival would come through town annually, with a Ferris wheel, a merry-go-round and, of course, a midway: rows of makeshift stalls where fairgoers might win a prize by throwing a ball at weighted milk bottles, shooting a rifle at metal ducks, or pitching pennies at small glass bowls. If you were to succeed in any of the above, the standard prize was a small stuffed bear (Although many large bears were displayed, generally, the few actual penny-pitch winners only succeeded in winning one of the smaller bears). Still, to a child’s mind, even this was cause for celebration, as you went home a winner. I was one of the lucky ones. I actually did take home a prize on one occasion. I had been going to the fair faithfully every year and would save up my pennies for weeks in advance, so I’d have plenty to invest in bear futures on the midway. It was only a day or two after I brought home my prize that I realised that I had spent several dollars in pennies winning a stuffed bear that probably (back then, in the 1950’s) only cost fifty cents to produce and, after I possessed it, actually had zero value to me…I had no use for a cheap stuffed bear. 1. Promise of significant benefits for what seems a minimal initial investment. 2. Excitement builds with continued investment. 3. Elation when a prize is actually won. 4. Realisation that the prize is of less actual value than anticipated. 5. Realisation that the aggregate cost of the prize was so high that the money would have been better spent on something else. In 1993, Europeans were invited to the new EU Carnival. In addition to the rides, there would be a midway: a variety of benefits such as open borders, a common currency and the opportunity to work in other countries more easily than before. Most European countries joined, even though, in most cases, only a minority of registered voters actually declared their desire for membership. The midway organisers (the political leaders) were all in favour and virtually everyone joined. Like any midway game, all those who signed on were required to pony up, but the amount of money being invested seemed relatively small at the time. But like any midway game, it’s not the first pitch of the penny that gets you…it’s the subsequent, seemingly unending ones. It adds up. Still, there have been those who have actually benefitted: those who actually moved to another EU country and got a good job; those who conduct multi-national business, etc., but, in the main, the conveniences have not been that great and the negatives, more and more, are eclipsing the benefits. The non-elected oligarchy of the EU passes new laws at will. Moreover, at this point, so much money has been thrown at non-productive members that entire countries are, in effect, welfare states, living off the teat of the more productive countries. And feeding them has required unending and massive borrowing, which those who are pitching the pennies will, presumably, eventually have to pay. And each time it seems as though the situation couldn’t get any worse, Brussels creates a new diktat, such as the demand that all EU countries take in millions of refugees, whom they claim to be Syrians fleeing the civil war, but who are more likely to be from Afghanistan or North Africa and are people who demand benefits, but clearly have no desire to assimilate. The people of Europe have been the patsies in this grand scheme and are, at this point, experiencing decided buyer’s remorse. 3. Elation when a benefit is actually received. 4. Realisation that the benefit is less actual value than anticipated. 5. Realisation that the aggregate cost of the benefit was so high that the money would have been better spent on something else. Returning to the penny-pitch, I recall that, by my early teens, I had realised that this was far from being a worthwhile investment. Once I realised that the prizes were of so little actual value to me and that I would have been better off spending my pennies in some other way, I ceased to enjoy the excitement of the midway and learned to invest money in a better way. I later prospered. And so we witness in virtually every “democracy” that conservatives such as David Cameron and Donald Trump offer outrageously simplified and impossible promises and otherwise-intelligent voters march off to the voting booth to vote for them. Similarly, Hillary Clinton and Justin Trudeau leave liberal voters starry-eyed with equally outrageously simplified and impossible promises. The only difference between liberal and conservative is that the rhetoric takes a slightly different slant. The method of deception is the same, and the effect on voters is the same. And, of course, the outcome is the same. Trouble is, if we’re wise enough to figure out that the penny-pitch is a mistaken pursuit, we can simply walk away and never come back. However, if an entire country gets suckered into a construct as implausible as the EU, it’s not so easy to walk away. Brussels has no intention of folding its tent. Nor are the political leaders of Europe going to back off on the EU idea. So, will the EU simply carry on? It’s doubtful. At some point, the debt will cripple even the net-payer countries to the degree that the people will rebel. In addition, the social dictates, such as the acceptance of refugees, have been so dramatically damaging on the street level that the people of many countries are reaching the boiling point. Eventually this will travel upward, as we see in Poland where, in an election year, the government itself is saying no to Brussels, no matter how Brussels threatens to penalise them for not doing as they are told. The EU was never intended to serve the people of Europe, it was meant to empower the rulers of the countries of Europe and to subjugate the European people. Its days are numbered, but the cost of its demise will be borne by the people of Europe. Certainly, increasing numbers of them might wish that it could be as easy as throwing the stuffed bear in the dustbin, but it will not be so simple or so painless. CAMBRIDGE – In its September policy statement, the US Federal Reserve took into consideration – in a major way – the impact of global economic developments on the United States, and thus on US monetary policy. Indeed, the Fed decided to delay raising interest rates partly because US policymakers expect dollar appreciation, by lowering import prices, to undermine their ability to meet their 2% inflation target. In reality, while currency movements can have a significant impact on inflation in other countries, dollar movements have rarely had a meaningful or durable impact on prices in the US. The difference, of course, lies in the US dollar’s dominant role in the invoicing of international trade: prices are set in dollars. Just as the dollar is often the unit of account in debt contracts, even when neither the borrower nor the lender is a US entity, the dollar’s share in invoicing for international trade is around 4.5 times America’s share of world imports, and three times its share of world exports. The prices of some 93% of US imports are set in dollars. In this environment, the pass-through of dollar movements into non-fuel US import prices is one of the lowest in the world, in both the short term (one quarter out) and the longer term (two years out), for three key reasons. First, international trade contracts are renegotiated infrequently, which means that dollar prices are “sticky” for an extended period – around ten months – despite fluctuations in the exchange rate. Second, because most exporters also import intermediate inputs that are priced in dollars, exchange-rate fluctuations have a limited impact on their costs and thus on their incentive to change dollar prices. And, third, exporters who wish to preserve their share in world markets – where prices are largely denominated in dollars – choose to keep their dollar prices stable, to avoid falling victim to idiosyncratic exchange-rate movements. What little impact import price shocks have on US inflation is highly transitory, with most of the effect tapering off after just two quarters. A sharp 10% appreciation of the US dollar, for example, would reduce inflation for non-fuel imports by 4.4% cumulatively over the next 2-3 quarters, but would have only a negligible impact on inflation after that point. If one accounts for consumer goods expenditure on imports, that 10% appreciation would lower inflation, as measured by the consumer price index (CPI), by just 0.5 percentage points in the first two quarters. And that is likely to be an upper bound, because it assumes that US retailers will pass through to consumers the full amount of any increase in import prices. In practice, they are more likely to increase retail markups and lower cost pass-through. The estimated price pass-through for imported manufactured goods, which would better represent what enters the consumption bundle, is even lower than that for all non-fuel imports. Although these factors insulate the US from the inflationary pressures stemming from exchange-rate fluctuations, they increase the vulnerability of other countries, especially emerging economies. Because the dollar prices of most of these countries’ imports are not very responsive to exchange-rate movements, the pass-through of those movements into import prices denominated in their home currencies is close to 100%. The impact of exchange-rate movements on inflation in most countries is thus 3-4 times larger than in the US. A 10% depreciation of the Turkish lira, for example, would raise cumulative CPI inflation by 1.65-2.03 percentage points, over two years, all else being equal. Despite this imbalance, the US dollar’s dominance as an invoicing currency is unlikely to change anytime soon – not least because bringing about a shift would require coordination among a huge number of exporters and importers worldwide. The euro might seem like a strong contender, given the volume of trade among eurozone countries; but, outside Europe, the currency is not used nearly as widely as the dollar. In deciding when to normalize interest rates, the Fed has placed considerable weight on the weakness of inflation, and its global underpinnings. But while it is true that some global developments – especially falling commodity prices, and perhaps also slowing emerging-economy growth and rising financial volatility – may push down inflation, dollar appreciation will not, at least not in any meaningful way. A stronger dollar thus is not a legitimate reason to delay the normalization of US interest rates. Is Anybody Okay Out There? In normal times, the world's major economies are a mixed bag. Some are up, some are down, some are placid, some are in crisis. It's only at the boom/bust extremes that everyone finds themselves in more-or-less the same boat. ...while its debt continues to soar. Brazil's economy has been shirking since April, and the decline is accelerating. See Brazil in free-fall mode. Get ready for terrible Q3 print, analysts warn. Europe is descending into a combination of financial and geopolitical chaos that might dissolve not just the eurozone but major parts of the European Union, notably the free movement of people across internal borders. See Europe is sliding towards the abyss and the terrorists know it. China pretends that it's still growing, but no one believes it anymore in light of things like this: China's Steel Industry Peers Into Abyss as Output to Plunge. The Middle East civil war has now sucked France and China in alongside the US and Russia. See Beijing vows justice as ISIS kills Chinese, Norwegian hostages. Even the US, which most of the world seems to consider an island of stability, has soaring debt and a slowing economy. See Housing starts just plunged to 7-month low and Retail reality: another sign a recession and crash are imminent. The lone bright spot is financial asset prices -- but market breadth has deteriorated alarmingly. Most stocks are flat to down (in some cases down hard) while the broad indexes are supported by just a handful of rising issues. See Nifty-Fifty becomes Fab-Five. So why is the whole world simultaneously in financial/geopolitical crisis? Because the whole world has been making the same set of mistakes. Armed with unlimited monetary printing presses, most major countries have been operating with the sense of omnipotence that flows naturally from the ability to create money out of thin air. The US built a global military empire with borrowed money and proceeded to bully the rest of the world almost randomly, destabilizing the Middle East and stirring up resentment everywhere else. Europe adopted a fatally-flawed common currency on the assumption that it would paper over the resulting crises with new credit. China thought it could build roads, airports and entire new cities with borrowed money, and that all of those assets would magically generate copious free cash flow. And Japan has avoided making the structural changes necessary to deal with an aging population, simply borrowing and printing the yen needed to get through each budget cycle. In other words, for quite a while everyone was able to ignore the bit of common sense that says "when you find yourself in a hole, the first thing to do is stop digging." Instead they assumed that they could dig forever because their "modern money" would always be there to bail them out. Now here's where it gets really interesting. The debate has shifted to whether current policy has failed because it's based on false assumptions and flawed models -- or because it wasn't pursued with enough enthusiasm. Since no one likes to accept blame or give up power, the folks in charge will almost certainly choose the latter explanation and give it one more go in 2016, bigger and better, shock and awe, NIRP, war on cash, QE for the people. Toss those things into the current mix and you've got a year for the history books. The “Home of Fifa” is an oblong building on a hill above Zurich. Wrapped in strips of grey netting it appears impenetrable, and for decades it seemed as if that was the way football’s governing body liked it. Fifa has always been a secretive club, accountable only to itself. But in May its world fell apart. Criminal investigations into corruption in both Switzerland and the US triggered an internal battle — still being played out — over how the organisation is run. The fight, in which Fifa president Sepp Blatter and his allies have been largely sidelined, has left control of the organisation in the hands of Fifa’s legal director and a US law firm hired to restore Fifa’s reputation and ensure its survival — even as fresh evidence of a cover-up of corruption at the top is unearthed. Fifa is facing an existential threat. Its revenues have been hit by the scandal, as new partners shy away, and there will be cost-cutting ahead. But inside the organisation many of those hoping to replace Mr Blatter when Fifa elects a new president in February remain in denial about the need for change, according to people close to the organisation. This account of the past few months inside the headquarters of world football is based on interviews with Fifa officials and others with first-hand knowledge of the last days of the Blatter reign. Most asked for anonymity due to the sensitivity of the situation. Mr Blatter was having his morning coffee when he learnt that Swiss police, acting on a request from the US Department of Justice, had swooped on the Baur au Lac hotel and arrested seven senior Fifa officials. It was 6am on Wednesday, May 27, and Marco Villiger, Fifa’s legal director, called Thomas Werlen to ask for help. For six years, Mr Werlen was the general counsel to Novartis, the Swiss pharmaceuticals group, as it battled accusations from the DoJ that it illegally marketed a number of drugs and paid doctors to prescribe them. It eventually paid $422.5m to resolve criminal and civil liability in 2010. Two years later Mr Werlen became a Zurich-based partner at Quinn Emanuel, the US law firm which had begun advising Fifa in 2014. Mr Villiger, who has worked at Fifa for nine years, also contacted Bill Burck, a one-time special counsel to George W Bush in Washington who is now a Quinn Emanuel partner. Today Mr Burck, who is also a former assistant US attorney in New York, acts as one of the main conduits between Fifa and the DoJ. After Swiss police swept through the hotel, investigators from the public prosecutor’s office arrived at Fifa headquarters to begin their own probe. In the aftermath, there was confusion about how to respond to the crisis. Senior Fifa figures, outraged at the timing of the raids — just two days ahead of a presidential election — accused the US of overstepping its authority. “There were many different responses within Fifa,” says one person who has spent considerable time inside the Zurich headquarters over the past few months. “At the worker level there was real shock and fear and confusion but also a sense of: ‘What can we do about it to make it better?’ At the political level, it was very different. There was a defiance and lack of appreciation for the severity of the situation,” he says. Even now, a number of Fifa’s leaders still “think this will go away”, says a person familiar with Fifa’s 25-strong executive committee, the cabinet that makes all major decisions. “Most of the executive committee are in denial. Only a small group understands,” he says. Nevertheless, the pressure was enough to force Mr Blatter into an about-turn. Just days after he had been re-elected for a fifth term as president despite calls for him to quit, Mr Blatter said he would stand down after a fresh election. Several people say the U-turn was triggered by warnings that he could become a target of the US investigators if he stayed on. “That is not true at all,” Mr Blatter told the FT in a recent interview. “I took personal advice not legal advice, from people I trust.” Among those he met was Mr Villiger, who explained Fifa’s legal position. After that, Mr Blatter says, he chose to go “to protect Fifa”. The US indictments could destroy Fifa. The DoJ — which opened its investigations at least four years ago — is prosecuting Fifa officials under the Racketeer Influenced and Corrupt Organisations Act, legislation drawn up to target mafia syndicates that had taken over otherwise lawful organisations. The DoJ is currently gathering more evidence and some of the arrested Fifa officials have agreed to co-operate with the inquiry. More arrests are expected in the next six months. If the DoJ charges Fifa with racketeering, its sponsors and broadcast partners would immediately have to cut their links and world football’s governing body — which had revenues of $5.7bn in the four years before the 2014 World Cup — would disintegrate. But there is wiggle-room built into the indictments. Fifa is also named as a “victim” of the alleged crimes, both in the US and Switzerland. In the US, courts have sent Fifa four “victim notices” so far — automatic notifications from the court to the injured parties in upcoming cases. “You can either be an entity set up to commit crimes, or you can be an organisation which has been used by individuals to commit crimes,” says a person familiar with Fifa’s legal woes. Since the break-up of Arthur Andersen, the accounting firm, in the wake of the Enron scandal, US prosecutors have been reluctant to chase companies into the ground, in order not to destroy the livelihoods of innocent workers, even if the organisation’s leaders are at fault. But the Brooklyn-based US prosecutors looking at Fifa are not white-collar crime specialists; they deal in organised crime. “They probably would have charged Fifa as a mafia enterprise and that would have ended it. But someone high up at the DoJ might have recognised that would cause a problem. The victim status is an interim solution,” he says. From the outside, Fifa did not look like a victim. Instead, its leaders were denying any significant wrongdoing. Fifa’s communications department was in meltdown. Quinn Emanuel hired Teneo, a strategic communications firm that had advised BHP Billiton, Novartis and UBS on their battles with US prosecutors to work with it on the Fifa case. The brief was to make the governing body appear transparent, less political and more co-operative says one person close to the organisation. But not everyone bought into the strategy. On July 20, Quinn Emanuel gave a presentation to the executive committee outlining how Fifa needed to present itself as a victim. The tension grew over the summer, with the Fifa leadership lining up against Quinn Emanuel — which has devoted a team of around 10 lawyers to the case — and the legal department. To the frustration of many, Mr Blatter continued to publicly condemn the US investigation as politically motivated. “Everyone told Blatter respectfully and repeatedly not to make public comments denigrating the investigation. He was asked to focus on football,” says one of his advisers. Pressure continued to mount. Jérôme Valcke, Fifa’s general secretary who was considering a bid for president, was suspended after being implicated in a World Cup ticket scandal. In August, Fifa’s sponsors arrived in Zurich for talks. “They said they were supportive of the plans, but why was no one controlling the president,” says one person present. “And they wanted to know how long the investigations would last.” They were told that Fifa’s problems with the DoJ would last for another year. Swiss officials believe their investigation will take five to six years. In October, Coca-Cola, McDonald’s, AB InBev and Visa called for Mr Blatter to immediately resign. He was forced out six days later, bringing to an end a 17-year reign, when Swiss prosecutors said they were investigating him over a Sfr2m ($2m) payment to Michel Platini, the head of European football. “No one laid any bear traps, but when the situation arose, they made sure the right thing was done,” says a person close to Fifa. Mr Blatter’s friends blame Quinn Emanuel and Teneo. “They have Fifa under control. No decisions are taken without their OK,” says one. Mr Blatter puts it more bluntly: “Quinn Emanuel is in charge of Fifa,” he says. His office, a 1,500 sq ft suite, has been cleared of his personal items, the pictures and souvenirs from around the world. Last Wednesday, his appeal against his suspension from all footballing activities was rejected. Since his departure, he has had a lengthy spell in hospital after suffering a “total failure of everything apart from his heart and brain”, says a spokesman. In July, Quinn Emanuel created an off-site data room to conduct its own investigation into Fifa. After sifting through thousands of emails, several more examples of suspected corruption — and apparent efforts to cover them up — were unearthed and forwarded to the Swiss authorities, according to people with knowledge of the investigation. But the DoJ has grown impatient with apparent foot dragging by Swiss authorities. “They want to see results,” says the person. The Swiss criminal code prevents foreign authorities operating within Switzerland without consent and the Fifa case has highlighted a transatlantic clash of legal cultures. Fifa’s administration, led by Markus Kattner, the acting secretary-general, is planning for a less rosy future. The executive committee met last month, when Mr Kattner gave a presentation on Fifa’s revenues and costs and how the crisis was affecting the organisation. The most important reform, stripping the committee of its executive powers and giving operational control of Fifa to an appointed chief executive, is also winning support. “The reforms will go through even if [member] countries do not want them, otherwise they will be hit in the pocket. They need the reforms to get the revenues they want because otherwise the sponsors will leave,” he adds. Others close to Fifa are studying the creation of a “bad bank” structure, where Fifa’s historic operations are left behind to co-operate with the DoJ while the organisation forms a new arm to move into the future. “You want the body in charge of world football to survive and carry on without living in a constant state of crisis,” says one person familiar with the talks. What is clear is that Fifa’s low, grey, oblong headquarters will have to become more transparent to survive, whether its leaders want it to or not. 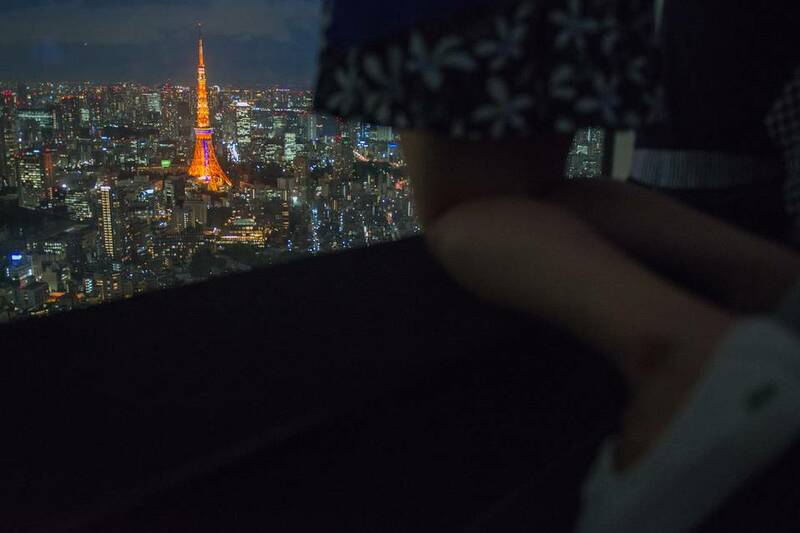 Japan is once again in recession. The situation isn’t dire, but weak corporate investment is an important warning sign that investors should heed. Japanese gross domestic product fell by an annualized 0.8% from a year earlier in the September quarter, the second straight decline. This may overstate the extent of weakness, as it was dragged down by a big drawdown in inventories. Japanese companies may soon have to step up production to rebuild those stocks, setting the stage for a rebound. However, the data highlight how vulnerable Japan remains to downturns. Its long-term potential growth rate, which economists estimate is only around 0.5%, means that the economy is basically always on the verge of a recession. That Japan’s working-age population is shrinking by around 1% a year is a powerful drag. Weak potential growth explains why corporations are hesitant to invest in the future. One of the weakest readings in the third quarter data was private, nonresidential investment, which mainly reflects capex spending by businesses. This fell 1.3% from the previous quarter, or an annualized 5.0%. Unless companies believe that the long-term outlook is getting better, they will continue to hoard cash rather than spend on new factories and the like. 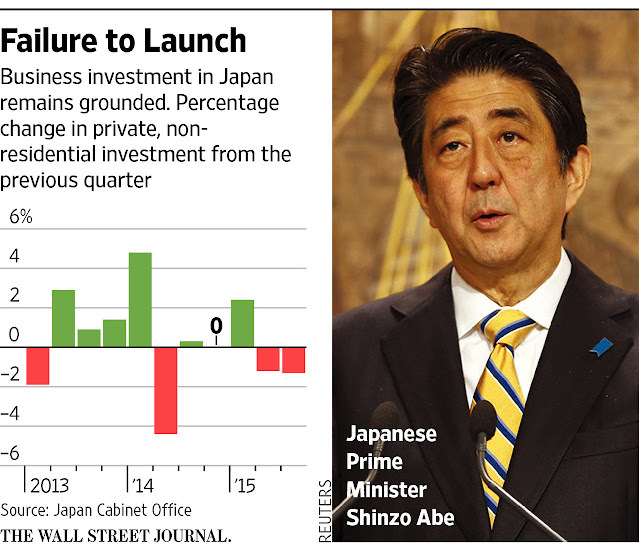 Raising the potential growth rate is therefore the most crucial task for Prime Minister Shinzo Abe. There are really only two ways to do this: increase the size of the workforce or raise the average productivity per worker. Japan shows little sign of allowing more immigration, the easiest way to grow the workforce. Mr. Abe does deserve credit for pushing hard to get more women working. Japan now has a higher percentage of working-age women employed than the U.S. or Europe. But many of these women are in part-time jobs with less potential for advancement. Boosting productivity is even harder. Again, Mr. Abe gets credit for pushing the Trans-Pacific Partnership free trade pact, which will aid productivity by opening up sclerotic domestic sectors to new competition. Also needed are reforms to make the labor market more flexible so workers can shift to industries or jobs in which their skills are most needed. If growth keeps disappointing, the Bank of Japan 8301 -1.24 % will continue to feel pressure to ease policy further. The BOJ’s official forecast, that GDP will rise by 1.2% in the fiscal year to March, already looks unobtainable. But the BOJ has also long argued that it can’t do the job itself, and it needs the government’s help with structural reforms. With Japan in its second recession in two years, investors should hope that Mr. Abe gets the message. Every once in a while, we reiterate the importance of knowing the trend, in fact, calling the trend the number one piece of information. From it, everything else follows, in terms of knowing in which direction to base trade decisions. 2014 and 2015 were viewed as turnaround years for gold and silver, with expectations that price would rally to new, never before seen prices. In a little over a month, 2015 ends and 2016 begins right after. It is possible that 2016 may bring more of the same: disappointing expectations for PMs performance. It is just a possibility, for no one knows for certain how the future will unfold. What we do know for certain is that in order for PMs to rally, they must first stop going down. We have been telling readers to avoid the long side in futures for the past few years. We are also on record for advocating the purchase of physical gold and silver at any price, and all purchases made in the past few years are likely in the red. While true, that is not the issue in owning the physical for the reasoning is totally different. Physical ownership is more a form of insurance against the failure of the fiat Federal Reserve Note, aka the "dollar." 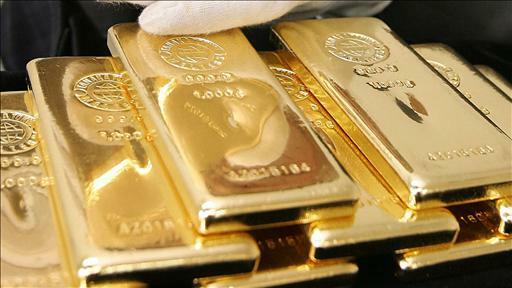 Reference was made to holding physical gold and silver as a form of wealth preservation. Some, perhaps even many may think their wealth is not being preserved very well for those purchases made since the PM peak, 5 years ago. This is true, in absolute terms when using a fiat currency as one's measure. It is a testament to the ability of the globalists to keep a price lid on both gold sand silver, mainly through the US central bankers. Few believed the financial Ponzi scheme could be stretched as much as it has. What we all have learned is to realize the importance of a fiat trend, as well as a market trend. When the fiat trend ends, the doors may close for the ability of one to buy more physical gold and silver, and the purchases made, even currently showing a loss in value, will be a saving grace after a temporary price disadvantage. Do not be discouraged and continue to buy more as one can. All fiats fail, and the only difference this time around is the grossly exaggerated extent to which fiat has managed to survive. It also indicates that once the fiat "dollar" fails, and there are more and more cracks showing up in its ability to maintain its world reserve currency status, the move for physical gold and silver will also be favorably exaggerated to the upside. The fiat "dollar" chart does not show any ending action to the upside. The last two TDs [Trading Days], were narrow ranges: buyers were unable to extend higher, but at the same time, sellers were unable to take advantage so buyers continue to prevail and price should eventually carry higher. The only thing that can alter this assessment is if sellers suddenly show up in force. They have not yet, so mention is made only to recognize the possibility. The only purpose for including the weekly copper chart is to show how once a trend is established, it carries the prevalent momentum until the opposing force[s] become strong enough to effect a change. If that does not happen, you can see price will keep falling, more than most expected, and will continue to fall until it uncovers demand. Unless demand shows up soon, $2 copper is possible for as long as the trend remains down. Gold's decline is more controlled, no pun intended, as the lower lows do not go as deep as prior swing lows, which means the downside is just slowly giving way, but still going lower. This remains a function of price seeking demand, and until it shows up, just like in copper, price will continue to make lower lows. The first two of the last four TDs were sharp declines, the last two on much smaller bars but volume increased. This would be an indication that buyers were more than able to match the increased selling effort sufficiently to prevent price from extending lower. More than likely the buying is short-covering and not new buyers. If true and the next rally is weak, without new buying for support, price will decline still more. Because we know the trend is down, there is no guesswork about trading from the long side in paper gold. There is no need to "predict" the price direction. Just wait for more information that buyers are beginning to increase [which they are not, so far], and then have a strategy for buying in a changing up trend. Presently, there is no evidence of a change to an up trend, so wait for confirmation and keep one's powder dry. The EDM reflects how buyers cannot control selling. While price started to trade almost sideways, near the current lows, you can see, relative to the $120 decline from the last swing high, there has been no ability to mount a counter-rally, and that is a sign of weakness. Any change always shows up first on the smaller time frames. Yet, even the intra day 60 minute chart shows no sign of ending the current decline. Read all you want about the bullish fundamental climate for gold and silver, the reality is market participants are ignoring the current news and dealing with where price is and is headed. This is why charts are always more reflective of what is going on, at all times. Just like there was no ability to rally from the lows in daily gold, weekly silver is in a similar position. Last week's tiny range is hard to read: price could neither rally nor decline, a stalemate. The trend is down, and the onus for change is with the buyers. Until buyers make their presence known, expect more of the same. The rally in early October was on wider range bars and sharply increased volume. It shows where buyers stepped in and made a difference. Typically, buyers will defend those prices, anywhere from the top of the first wide range bar to the bottom of it. That potential support was totally ignored as price declined over the last several TDs, and that says weakness. Relative to the decline that started in late October, at a bull trap failed probe higher, once at the bottom of the current decline, there has been no ability to counter-rally. All of these observations are nothing more than reading developing market activity. They are simple and factual messages the market is conveying. These messages clear the fog formed from sentimental beliefs. Jettison the beliefs and stay with what the market says. Trading life becomes easier.